The one hundred-year old Flix electrochemical company is about to leave. What will happen now that the long-term impacts on human health and the environment are no longer compensated by short-term economic gains? View of the dicalcium phosphate plant before the decontamination project. Picture by Marta Pujadas. EQF (Electroquímica de Flix) is a chemical company founded in 1897 in Flix, a village in the Ribera d’Ebre, Catalonia. It was the first Spanish company to produce chlorine and caustic soda using the electrolytic method, and first supplied basic chemicals to the Spanish intermediate industry In the 1950s. The production capacity of EQF had grown a decade earlier with the construction of a hydroelectric plant. The corresponding construction of a dam was the first step towards a laminar flow of water in the lower part of Ebre basin, while the construction of two dams upstream, Riba-roja and Mequinensa, completed this process in the following two decades. The increasing availability of energy helped the company replace the old chlorine facilities with the introduction of a new mercury-based technology. This increased efficiency but caused widespread dispersion of heavy metals into the water, air and soil. Furthermore, a variety of organochlorine compounds were introduced in production, such as DDT, PCBs and CFCs, and were released into the air for decades. During the last part of the twentieth century, knowledge about the negative consequences of these pollutants and an increasingly demanding environmental regulation led to the closure of most organochlorine production lines. 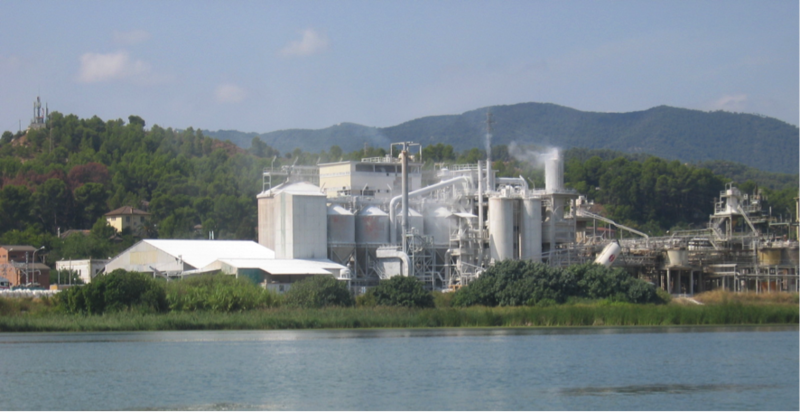 As production was reoriented to the inorganic chemistry sector, dicalcium phosphate production introduced a new environmental impact around Flix. The raw material contained significant quantities of radioactive elements that were added to the pollution released into the environment. The widespread dispersion of pollutants triggered the epidemiological studies carried out in the 1990s by Municipal Institute of Medical Research (IMIM) that found positive correlations between the levels of environmental exposure to HCB, 4,4′-DDE and methylmercury, the higher incidence of thyroid cancer in the factory’s workers and the premature birth rates and cognitive deficits in children from Flix. Furthermore, in 2004 the Spanish National Research Council (CSIC) warned about the existence of 700,000 tons of sludge polluted with organochlorine substances, heavy metals and radioactive elements in the reservoir close to Flix. The accumulated amount of these pollutants suggested a major environmental risk to the ecosystem and the population in case of dispersion. A similar distribution of pollutants was detected in the soil where the industrial facilities had been historically located. However, as EQF became a strategic industry for Spain’s chemical sector, public authorities often prioritized economic development and avoided environmental issues. The company operated irregularly for many years, eluding the implementation of preventive measures to reduce pollution and systematically violating the criteria for waste-water discharge permission. This led to a complaint for environmental crime against Ercros group, of which EQF was now a part, in 1993. Ten years later, five executives were sentenced to prison and an administrative sanction was applied to the company for the Flix reservoir restoration. However, the prison sentences were never executed and the fine was bounded to only 5% of the total cost of the decontamination project. This has meant the transfer of the EQF’s environmental liabilities to the public sector. The EQF’s environmental liabilities have been estimated between €400 and €500 million. This includes among others the reservoir restoration project (€184 million) and the costs of partially restoring the industrial land (which has been estimated between €100-200 million). The public sector will have to take responsibility for almost the entire amount, as the company is only legally required to cover less than €9 million. Extraction of polluted sediments. Decontamination project Source: Getinsa, 2013. Despite the existence of some critical voices throughout the century and the awareness of the population that the chemical industry could be harmful, a collective view emerged about the improvement in welfare produced by working in the factory. According to a large part of the population (in the 1960s a quarter of the workforce worked in the factory), long-term impacts on human health and environment were compensated by short-term economic gains. People did not deny the possible adverse effects of industrial pollution, but they trivialized its results under the argument of compensation. This was the consequence of a growing sense of belonging to the factory throughout the century. EQF has absorbed much of the daily life of the community and the lifestyle came to be determined by the factory. 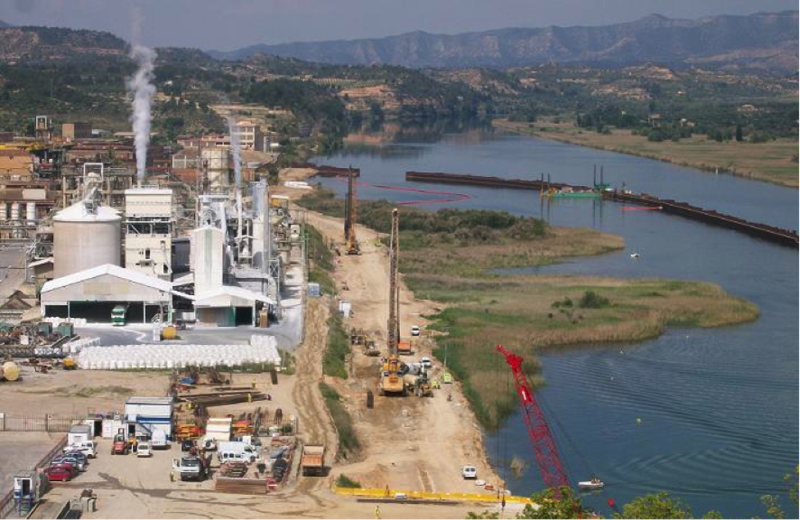 The Ebre River was no longer a “special place” for the inhabitants of Flix, which has been transferred to the factory. Unions did not make environmental claims. There have been almost no complaints about environmental issues until the 1990s, and especially in 2013, when the threat of the factory closure and the loss of workplaces emerged. In 2013 an employment regulation plan placed industrial activity to 10% of 1960s levels, warning the population about the imminent closure of the facilities. Today Ercros is legally required to replace the current chlorine production technology with membrane technology by 2018. However, Ercros Group has announced that it is in a critical financial situation due to energy prices, arguing that this investment is not possible for the company without public funding. This has led to the most important environmental conflict in the history of the factory where the population, led by the City council, has threatened to disclose sensitive environmental information against the company in case EQF does not guarantee a minimum future activity. The Environmental Liability Directive does not apply to the case of Flix. Therefore, as soon as the company leaves the village, the population will lose an important source of income, as well as the feature that has identified the community for over a century. Conversely, however, many environmental impacts will remain, damaging people and the ecosystem, while the costs of restoring the present situation and preventing future impacts will be assumed mainly by society. *Dr. Marta Pujadas is an Environmental Scientist who recently defended her PhD thesis at the Universitat Autònoma de Barcelona, under the supervision of Agustí Nieto-Galan and Joan Martínez Alier. Information on Flix can also be found in the Environmental Justice atlas.